Jagadguru Shankaracharya Sri Sri Bharati Tirtha Mahaswamiji is the present Jagadguru of the Sringeri Sharada Peetham. 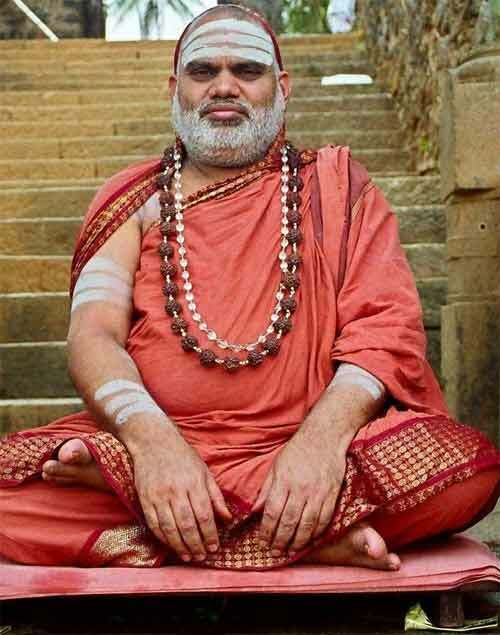 He is the 36th Guru of the Sringeri Sharada Peetham. These quotes and teachings of Sri Bharati Tirtha have been collected mostly from online sources. By continuous contemplation on God, the tendency of the mind to go out in search of ephemeral objects gradually decreases, and slowly the mind becomes tranquil. Sins and virtues stem at the level of thought. It is only a thought which marks the beginning of any action. So it is essential to harbor good thoughts which in turn leads to good actions and fetch good results. No purpose is served in seeking solitude and dwelling alone in the Himalayas, without the control of the mind. It is mind control that helps one along the spiritual path, and not the place where he lives. Many lose their grit and confidence under tribulations. Some even consider suicide. Ups and downs are natural in life. Even emperors such as Yudhisthira had to live in a forest. Even a wealthy person may at some point of time be constrained to lose everything. Likewise, even the most courageous will occasionally be gripped by fear. Let the people in difficulties realize this. Intense prayer to Lord will remove all the difficulties and Good days will definitely dawn upon them. You are the master of your fate. Fate being the sum total of the results of your past actions, it has been set forth by you. Realize this and use the present to better your future. One should attribute one’s joy and sorrow to one’s own karma and desist from giving room to extremes like over excitements or poignant dejections. Equanimity must be present in all our actions. Chanting the names of God have a tremendous purifying effect even when chanted unknowingly. What needs to be said of a single divine name chanted with full concentration and devotion? It annihilates all sins. To profess allegiance to God in speech and then to disobey God in action is no devotion at all. Let devotion be reflected in your actions and you shall soon attain Shreyas. To get rid of jealousy, one must learn to be content with what one has. If a person younger than us rises in stature, we should be happy for him. If he pays his respects to us, we must bless him and not burn within. Obligatory karmas prescribed by the Vedas must bear fruit as they are dedicated to God. However the performer must not simply mutter the mantras that dedicate the karma to God. Rather, he must actually dedicate it with all his heart even as the mantra is said. The karma having been dedicated to God should make the work all the more fruitful. The selfless devotee who has totally surrendered to the Divine is sure to be rewarded by the dawn of the Divine Consciousness, which makes him blissful and immortal. No one can take a chance and wait for tomorrow to do something good, because life itself is very uncertain. Hence one must try and engage in the worship of Ishawara right from a young age when the body is fit and the mind is fresh. Nowadays, we see that people are ever engaged in singing the praise of persons who are wealthy and those who have some authority in the society. If only they begin to use their talent for praising Ishwara, they’ll attain Shreyas. Know that as soon as you come into this world, your past actions have already set in motion both pleasure and pain to be enjoyed by you in this life. Hence it is essential for you to cultivate a sense of equanimity ( towards pleasure and pain) and makes the best use of the human birth. Ishwara possesses everything and is perfect. However, to show to the world the importance of “paropakara” and to serve the erring mankind from disaster, He has chosen to incarnate from time to time. When one understands that longing has misery for its fruit, the only proper remedial course open to one is to use one’s discrimination and be content with what one obtains, by his prarabdha. God is characterized as the one who upholds the existence of all that is, by virtue of His infinite spiritual potency. At the same time He is an ocean of mercy. Anyone can turn to Him at any time. Just because a small vessel can hold only a little water from a river, it does not mean that the vessel itself is the limit for the capacity of the river. If one takes a big vessel to the river, one can bring a large quantity of water. The Guru is like a river. It is up to each individual to make the best of the Guru’s association to attain shreyas. Humility and strength of character, acquired as a result of a sound education, ensure that the youngster will prosper in his or her profession and stay in the path of Dharma. A man must train himself to see only the good in other people, although every human has both good and bad qualities. When a man trains himself thus, he will progress fast and ensure the welfare of the society. Sri Rama and Yudhisthira are great examples in this regard. Look up to them and learn from their lives. It is known that one can achieve success in any endeavor only with proper thoughts. The Shastras state that Ishwara graces a person by inducing appropriate thoughts in his or her mind. Hence it is essential to earn the grace of Ishwara. All the pleasure of this world and heavenly joy put together, cannot equal a fraction of the bliss of a person who has cast off his desires. Therefore a wise man tries to achieve desirelessness in this world. It is in our tradition to name children after God. Why is this so? One may remember that Ajamila a great sinner was granted refuge after death simply because he died calling his son, whose name was Narayana. It is with the notion that we call out the Lord’s name frequently at least by way of addressing children, that we name children after God in our tradition. Understand the importance of chanting the Lord’s names. Do not derive satisfaction that you have done a puja well simply because you have offered fragrant flowers, special perfumes and a variety of eatables as Naivedhya. Without offering one’s mind, no amount of other offering will make the Puja complete. For the benefit of the devotee, the Supreme formless consciousness takes on the form of Shiva, Vishnu, Amba, etc. The true devotee gets pulled towards an Ishta Devata (a divine form of his or own liking)., that brings about his welfare and ensure that the devotee attains liberation before long. One should not live one’s life with a desire that no one censure him and all should ever praise him. This is impossible. There were critics of even Sri Rama, the very embodiment of Dharma. How can a mere mortal achieve what Sri Rama himself could not achieve? Lead your life in accordance to Dharma and be truthful to your conscience. Showing kindness to those in suffering and cultivating friendship with the wise man should be one’s primary duty. Gifts given with courteous words, scholarship without pride, bravery coupled with forgiveness and wealth spent in charity are indeed the four of the rarest qualities in this world. One should not give any weight to the praises and denunciation of others. If one is concerned about praise and censure of others, all his spiritual pursuits will go in vain. One should conduct one’s life in the manner prescribed by the Guru and the Shastras. It is not possible for a person whose mind is ever dedicated to God to be preoccupied with transient, mundane difficulties. Neither will such a person get unsettled by difficulties, God will give him the strength to face and surmount his problems.